Considering the importance of closer regional economic cooperation and integration through enhanced regional connectivity by road for cross-border to improve connectivity and people to people contact for furthering the shared goal of overall economic development, a meeting of the Secretaries of Transport of India, Myanmar and Thailand (IMT) was held in Bangkok, Thailand on 13-14 July 2015 to reach consensus on signing and operationalising the IMT Motor Vehicle Agreement (MVA) which has been under negotiation since March 2015. It may be recalled that the text of the MVA was already finalized by the three countries in the Transport Secretaries meeting, held in June 2015 at Bengaluru, India and the meeting at Bangkok was primarily to discuss and finalize the Protocol of the IMT MVA. The Meeting at Bangkok was attended by delegations from the IMT countries comprising Secretaries of Transport and other transport and customs officials, and was supported by staff and consultants of the Asian Development Bank (ADB). The meeting emphasized on the importance of the IMT MVA and its critical role in realizing seamless movement of passenger, personal and cargo vehicles along roads linking the IMT countries. The initiative also will establish road connectivity between South Asia and Southeast Asia, which will strengthen economic integration and cooperation between the two sub-regions and boost their collective economic progress and development. The Transport Secretaries meeting was preceded by the IMT Customs Sub-group Meeting on 13 July 2015 to address the various customs-related issues in the protocol to be finalized under the IMT MVA and consensus was reached that the customs issues identified would be incorporated in the Protocol(s). Various non-customs related issues for the protocol were also negotiated and a largely agreed text of draft Protocol(s) was developed in the meeting. The Meeting recognized the importance of carrying out necessary actions to ensure speedy finalization of the text (Protocol/ Schedule) as part of the IMT MVA. It was decided that the IMT MVA will be signed during a proposed Transport Ministers’ level meeting of three countries in Myanmar in November 2015. 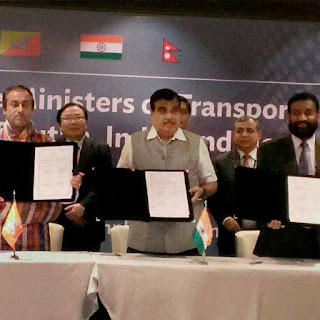 The signing of the agreement and its implementation is planned by December 2015 and is expected to be operational in 2016, opening the way for movement of cargo and passengers (including personal vehicles) on the India-Myanmar-Thailand road corridor. During the last three years, about 545 km of National Highways have been constructed in border areas. Development of National Highways in border areas is a continuous process and carried out as per availability of funds and inter-se priority. National Highways Authority of India has taken up upgradation of NH-209 from Bangalore to Dindigul. The stretch from km 424/920 to km 458/420 is proposed to be upgraded to 4 lane standard and the stretch from km 287/500 to km 424/920 is to be upgraded to 2 lanes with paved shoulder standard in Karnataka state which is under bidding process. The estimated project cost is Rs. 668.18 crore and the expenditure incurred so far is Rs. 79.8 crore towards land acquisition. The stretch from Dindigul to Annur in Tamil Nadu is proposed for four laning and the stretch from Annur to Tamil Nadu/Karnataka border is proposed for 2 lanes with paved shoulders. These projects are in DPR stage. The bridges at Middle Strait and Humphrey Strait in Andaman & Nicobar Islands have been sanctioned for Rs. 262.97 Crore and Rs. 277.17 Crore respectively on 31.3.2015. Work for development of National Highway from Chidyatapu to Jirkatang is included in Annual Plan 2015-16. Government has recently reviewed certain stalled highway projects under different phases of National Highways Development Projects (NHDP) as per details placed at Annexure and directed National Highways Authority of India (NHAI) to focus on completion rate of on-going projects and ensure full implementation of the dispensations approved by the Government and to evolve innovative financing models and strive for regular bilateral/multi-lateral funding and/or private participation on high priority projects. In order to mobilize funds for the NHDP, NHAI had earlier drawn up a financing plan based work plan in 2014-15 to award the balance length of NHDP by 2015-16 and funds requirement of Rs. 2,31,000/- crores and borrowings of Rs. 1,80,000/- crores had been estimated for the period upto 2030-31. However, due to economic downturn and various other reasons, NHAI could not award the project as targeted. Therefore, a revised work plan has been drawn up as to award the implementable balance length of NHDP by 2016-17. On the basis of this revised work plan and considering its cost alongwith the revised parameters for the actual cost of Land Acquisition, funds requirement has now been estimated at about Rs. 2,37,000/- crores and borrowings at about Rs. 1,53,000/- crores over a period from 2015-16 to 2019-20. Delay in land acquisition and change of scope etc. Matter has been taken with the State Government for expeditious acquisition of land. Delay in land acquisition, delay in forest clearance change of scope, delay in utility shifting, delay in removal of encroachments stoppage of disbursement of loan by the lender. With the interaction of Hon’ble High Court of Rajasthan, most of the encroachments have been removed by the State Government of Rajasthan and Haryana. To overcome financial crunch of the concessionaire, NHAI has allowed deferment of premium reviewable by NHAI. Termination notice issued on 07.03.2014 and challenge by the concessionaire in the Hon’ble High Court of Delhi. Matter is subjudice. Pending forest clearance for majority of the stretch (52.12 km), the concessionaire has not started construction. Matter has been pursued with the concerned Department. Delay in handing over in encumbrance free land and utility shifting by State Government. Concessionaire demobilized in site March 2012 due to funds constraints. State government has been requested to expedite land acquisition process. Government has proposed for development/upgradation of certain stretches of national highways by foreign government companies through Government Route. A delegation from the Ministry of Road Transport and Highways visited Malaysia in April 2015 and in turn the Malaysian delegation visited in June 2015. However, no special Terms & Conditions have been laid down for such companies and no relaxation has ever been offered to these companies. Also No time frame or target has been fixed by the Government for such involvement of foreign government companies. A total of 91 projects involving capacity addition of 521.45 Million Tonnes per Annum (MTPA) have been awarded during the last 3 years and up to 30.6.2015. (iv) Deepening draught in Ports to handle larger vessels. (v) Installation of Vessel Traffic Management System (VTMS) for smooth movement of vessels. (vi) Implementation of Web-based Port community system. (vii) Conducting benchmarking study for upgrading the existing ports to the International standards. This information was given by Minister of State for Shipping, Shri Pon Radhakrishnan in a written reply to a question in theLok Sabha today. (i) Ministry of Tourism under its Scheme for Assistance to Central Agencies extends financial assistance to the Ports and Lighthouses for development of cruise related Tourism Infrastructure. The Assistance is extended for smooth operation of cruise liners that call on Indian Ports and also for up-gradation of existing cruise passenger terminals. (ii) Ministry of Tourism has identified theme based circuits under recently launched Swadesh Darshan Scheme to promote tourism in the country. One of the circuits identified is “Coastal Circuit” for development of coastal tourism infrastructure in the country, which will result in development of cruise tourism. (iii) To promote lighthouses as unique tourism destinations, some lighthouses have been identified for development by Ministry of Shipping. Out of these, two projects at Chennai and Mahabalipuram have been completed. (iv) Foreign flag vessels carrying passengers have been allowed to call at Indian ports for a period of 10 years with effect from 6thFebruary, 2009 without obtaining a licence from Director General of Shipping. Keeping in view the present condition of Dhubri Port, a permanent Inland Water Transport (IWT) terminal at Dhubri with proper berthing and Roll-on–Roll-off (Ro-Ro) facilities along with shore facilities for handling of IWT traffic is being constructed at a location downstream of Panchughat. The location was selected after a detailed study by IIT, Guwahati. A land area of 1.79 hectare was acquired through Government of Assam during December-2010 and Detailed Project Report (DPR) was prepared. In addition, a temporary floating terminal is being maintained by Inland Waterways Authority of India (IWAI) at Dhubri. A Differential Global Positioning System (DGPS) station has also been constructed for safe navigation of the inland ships in the National Waterway-2. Since the work is being executed by CPWD on deposit work basis, the works are executed as per CPWD Manual. A Retired Senior officer of CPWD has been engaged as Senior Consultant to supervise the works on behalf of IWAI. In addition, IWAI has also opened a sub-office at Dhubri under Regional Office Guwahati for monitoring the day to day progress of construction.